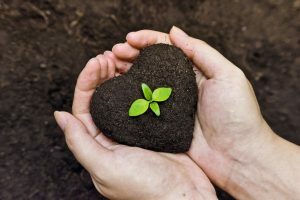 Although most people believe that the soil you use for your plants and vegetables is only dirty, this is far from even scratching the surface of what the truth really is. In fact, your soil is actually a very complex system that allows for the growth of numerous different types of plants, and nurtures them continuously, maintaining the balance of an ecosystem so complex that many scientists have dedicated decades of their lives in order to fully understand it. The main concept that everything revolves around is the tilth of the soil. Tilth is a curious word that represents the soil’s ability to support plant growth. This is obtained through a combination of factors such as texture, structure, fertility and the presence of the right microorganisms. When taken to the extreme (either in lack, or abundance), any one of these parameters can cause the soil to be unusable. Another thing you probably never knew about the soil in your garden is that it’s a thriving sanctuary for a huge variety of tiny organisms. If you put the soil under a microscope, you will find a thriving variety of bacteria, protozoa, fungi and a host of other species that you probably never heard too much about. Finally, it’s worth mentioning that the soil has a very fragile chemical balance as well. Elements such as pH, toxicity and the presence of the right amount of various compounds can dictate the type of pesticide and organic fertilizer that will work best for your soil in particular, but might not work for your neighbor’s. Before planting your garden, call utility locate Colorado technicians and have them inspect your property for buried cable or wire. The last thing you want to do is plunge a shovel into the ground and disconnect electricity or cable for you and your neighbors. You need to know where to dig!